LINCOLN, Neb. — Four nights after Tom Izzo called out Cassius Winston for his poor play in Michigan State’s previous game, the Spartans’ star point guard responded better than his coach would have expected. “I told him before the game, ‘You’re going to get measured on how you bounce back,’ “ Izzo said. 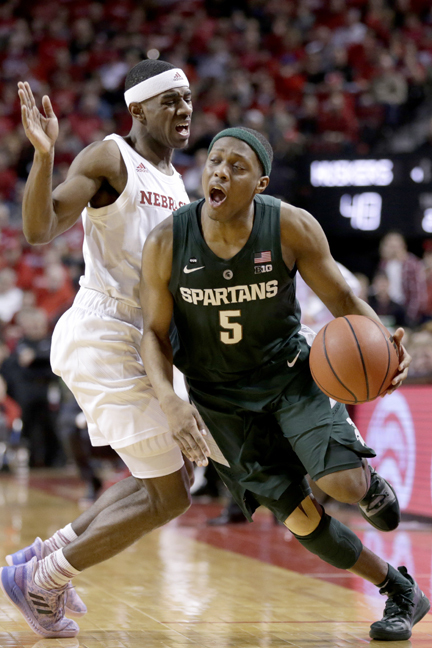 “Cassius, the way he ran that whole thing, he was like a quarterback dissecting a defense,” Izzo said. Of the Spartans’ first 18 field goals against Nebraska, Winston scored eight of them and had assists on five others. He held Watson, the Huskers’ hottest player the last week, to 3-of-13 shooting from the field and eight points. Izzo’s criticism motivated him, he said. “That should keep him happy for a week or 10 days,” Izzo said. “I wasn’t very pleased with our offense in any way, shape or form,” Nebraska coach Tim Miles said. Nebraska had hoped to build off its win at No. 25 Indiana on Monday night.